You can see Top 10 Marketing and Sales tools for Small and Medium Businesses and Top 3 Marketing and Sales tools for Small and Medium Businesses to look into details. Salesforce is one of the top three CRM tools for small and medium businesses. 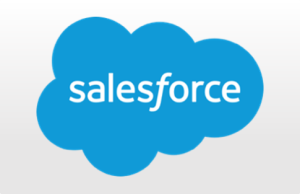 The most impressive thing about Salesforce is that it is highly customizable and handles the needs of distinct users with great precision. 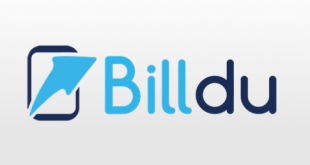 It provides on-demand solutions for sales management, customer relationship management, partner relationship management, market automation etc. The CRM solutions offered by Salesforce can only be deployed for SaaS (Software as a service).The applications for Salesforce are built on Force.com, a platform that has greater flexibility and scalability for different sizes of organizations. 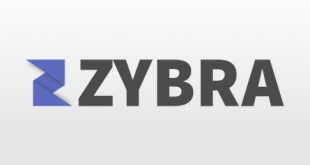 It provides custom application development for specific organizations and provides all the features for database management, security and user interface. The applications are designed, tested and deployed in the cloud so no extra cost is required. 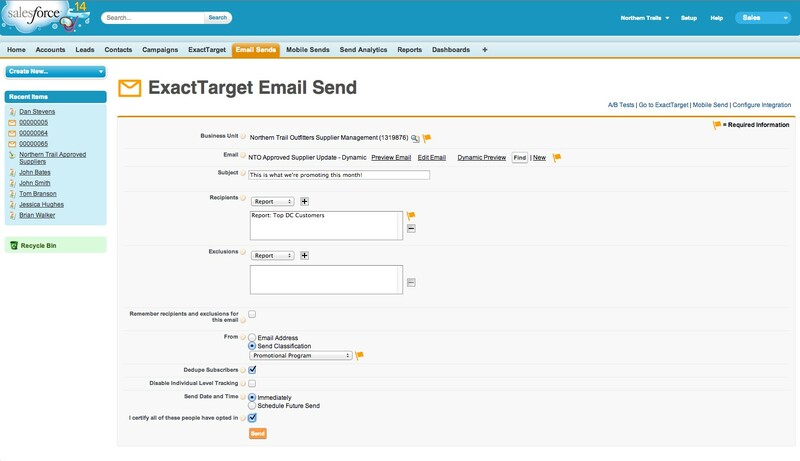 Salesforce can help your organization generate leads, manage a large number of contacts, track sales deals, and performance and create reports easily. 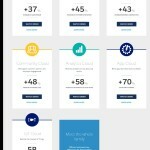 The different products are grouped into cloud suits like sales cloud, service cloud, marketing cloud, community cloud, analytics cloud, app cloud, IoT cloud. The most notable feature of this cloud is Sales Force Automation. 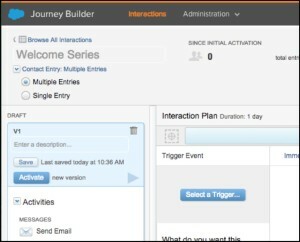 The sales cloud has a simple and intuitive user interface. Many competitors have tried to mimic the UI in their own products but none of them have proved to be as good as the original. Though marketing is only a subset of this cloud. It gives a unified agent experience for you desktop and mobile devices. You can quickly search relevant answers to your customer’s questions or they can search it themselves. You can deliver your services through social media channels. There are live agents that give personalized help in real time. Also, there are service cloud communities which allow customers to help each other irrespective of location or device. 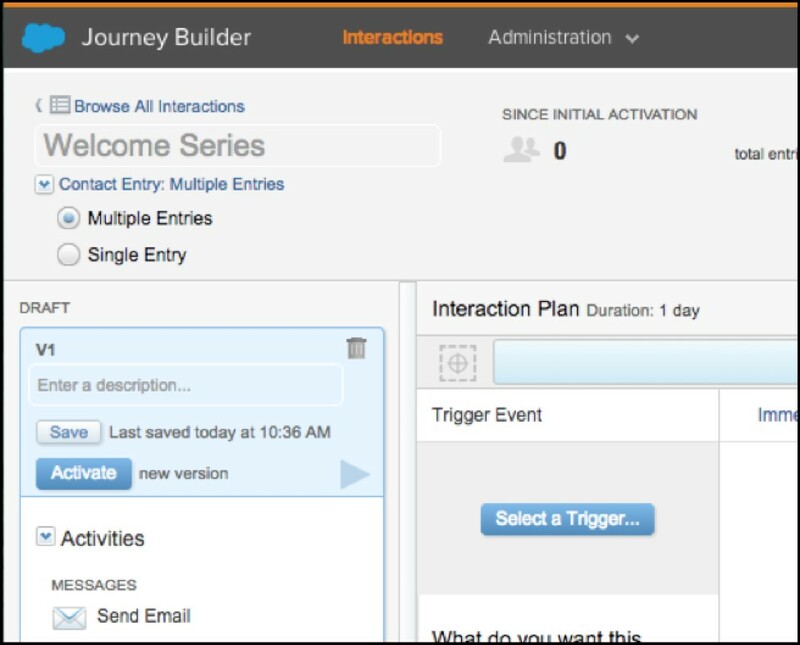 The marketing cloud offers a journey builder which allows you to guide your customers on a 1:1 journey so that you can deliver the right message at the right time. You can develop strategies and personalize the experience for the customers by conversing with them in real time. You can plan and optimize the journey by combining data and behaviors. Here the companies can create their own communities for employees, clients or partners. 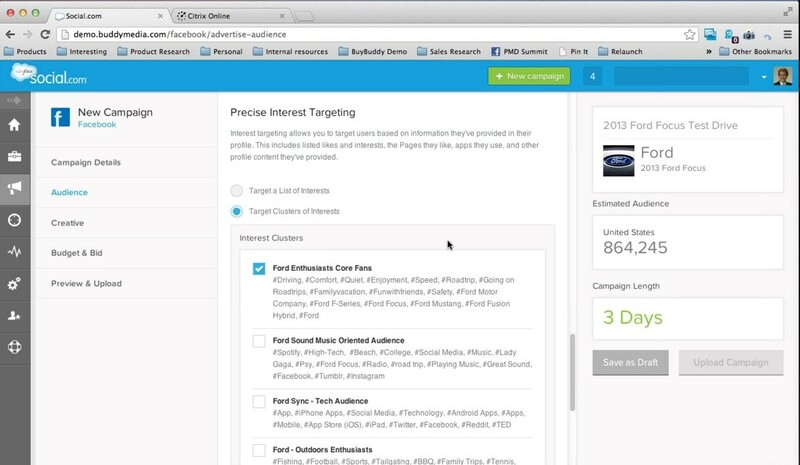 It has a new feature called Targeted Recommendations to bring the most relevant content to the community members. Also, there is Lightening Community Builder to help businesses build a customized community without any help from the IT department. The analytics cloud enables businesses to quickly explore data iteratively and views the results through dynamic visualization over the data sets. The information presentation is highly optimized for mobile devices of different types. 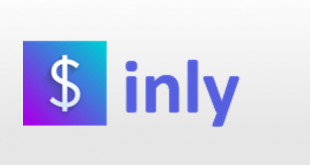 It provides shared identity services so that customers can easily build connected apps on Salesforce platform. It also offers trailhead, an educational component that lets developers understand to a usage of Salesforce developers tools. 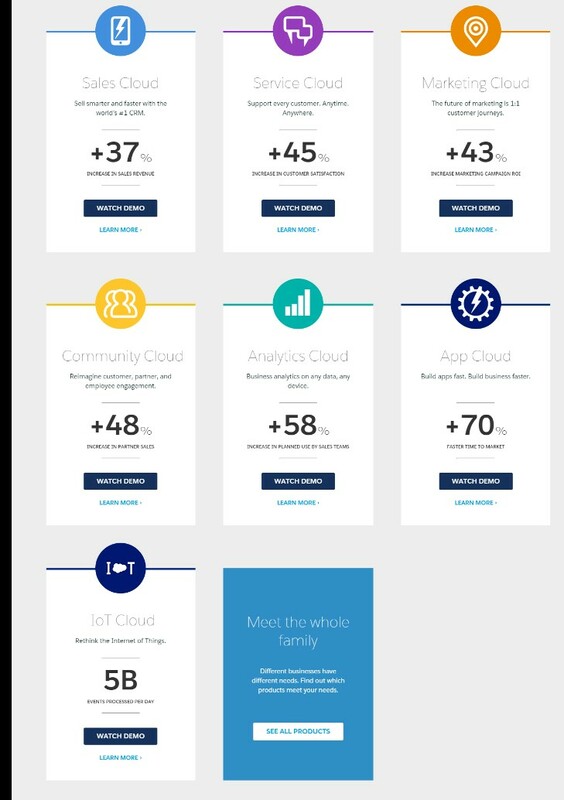 The Internet of things cloud allows you to convert any data generated by your customers, devices, and sensors into meaningful actions. Here you can process large quantities of data and offers some intuitive tools to engage with your customer in real time. 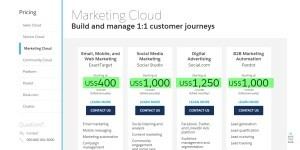 The marketing cloud has 4 packages, first is the ‘Exact Target’ which is for email, mobile and web marketing, its price starts at US$400/month (billed annually). Second is the ‘Social Studio’ for social media marketing, it starts at US$1,000 per month. The third one is called ‘social.com’ for digital advertising starting at US$1,250/month. The last one is ‘Pardot’ for B2B marketing automation which can cost you more than US$1,000. The application lets you design customer focused strategies by mapping customer journeys. You can have real-time interactions with customers across all channels and devices and leverage the data from any source. The marketing cloud provides some effective mobile solutions for your smartphone, tablet or laptop. You can establish two-way communications with pictures, audio, and video. You can track and send mobile messages across the campaign and automate activities like refreshing. The application can take your brand’s social media presence to new heights. You can get insights into people’s demography and sentiments. You can preview social content before sending it out. You can use pre-built or custom built themes and templates for your content. 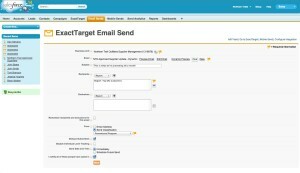 The most significant tool for maintaining online commerce relationships is email. This application provides email marketing ranging from basic ones to sophisticated tools having cross-channel functionality. There are some really convenient drag-and-drop tools for audience segmentation. It has comprehensive tracking so you could see page views and click through rates. You can predict and automate marketing decisions by collecting behavioral data, inferring preferences and predicting the next best content. Social.com lets you create highly effective advertising campaigns so you can get real business results. You can advertise on Facebook, twitter and LinkedIn and test the effectiveness of these campaigns. You can assign a content expiration date to locate marketing content quickly by using search and filter tools. You can manage complex data easily with the data management solutions and track it using the analytics tool, Discover. It is a robust social marketing solution. It can help your business build a strong social media presence. It lets you automate your advertising campaigns and develop quality content for them. You can create content for target demographics and monitor brand visibility. You can refer the detailed Marketing and Sales tools product reviews for Timetrade and okta for a quick comparison.